You could create custom "gridlines": add a data series with constant values for each "gridline". Select each of these constant series and change their chart type to a line without markers. 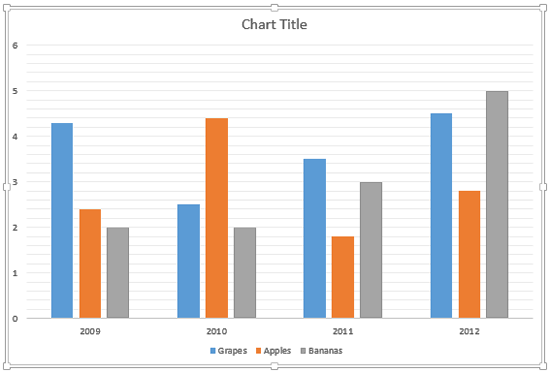 Select each of these constant series and change their chart type to a line without markers.... On the cluster, change gap width to 500%, and color it a light grey. You can hide the secondary Y axis - I left it in the screenshot for clarity. You can also hide the "Vertical" column name from the legend as well - just click on to it and hit delete. That will reveal the Chart Elements plus sign icon and the Chart Styles paintbrush icon. Click the Chart Elements icon. This should reveal a list of checkboxes for things like Axes , Axis Titles , etc. Ensure that the Gridlines checkbox is checked. How do I enable vertical gridlines in Excel 2013 Pivot Chart? On the cluster, change gap width to 500%, and color it a light grey. You can hide the secondary Y axis - I left it in the screenshot for clarity. You can also hide the "Vertical" column name from the legend as well - just click on to it and hit delete. This should reveal a list of checkboxes for things like Axes, Axis Titles, etc. Ensure that the Gridlines checkbox is checked. Then, click on the right arrow icon next to Gridlines to reveal another list of checkboxes for things like Primary Major Horizontal , Primary Major Vertical , etc. Ensure that the appropriate vertical selections are checked. You could create custom "gridlines": add a data series with constant values for each "gridline". Select each of these constant series and change their chart type to a line without markers. Select each of these constant series and change their chart type to a line without markers.